The iPhone changed mobile phones forever, and the handset itself is forever changing. The latter point may not be obvious, especially if you're used to tracking seemingly slight iterative changes to technology; but in reality, every iPhone has offered something new, from major software features to hardware updates. We're interested in what's coming next. Through a combination of patents, rumours, deduction and speculation, we've got a handle on the iPhones you can expect from Apple this summer – and what you can look forward to over the next few years. Apple typically overhauls the iPhone's design every other update, and so 2015's handsets will look almost identical to their predecessors. However, there are rumours of a 'Rose Gold' colour, to match the Apple Watch Edition. Also, the devices might use the same alloy as Apple's wearable – '7000 Series' aluminium. Apple explains that this is light, durable, 60 per cent stronger than most aluminiums, and a third of the density of stainless steel. This, or some other strengthening, should avoid a repeat of 'bendgate', providing the iPhone 6 Plus's successor, in particular, more rigidity. Anyone hopeful of a Liquidmetal iPhone is probably out of luck. Although Liquidmetal alloys are durable and resilient, they're tricky to machine, and even proponents reckon they're years away from large-scale products. Referring to imminent iPhones, Apple SVP Phil Schiller, in an interview with Daring Fireball's John Gruber, asserted that Apple had not “hit the point yet where we're trading off thinness for features, and capabilities at the expense of the best-optimised product” – so expect even thinner devices in 2016. However, filed patents suggest that such iPhones might include waterproof components that don't compromise the design, buttons with touch sensors that are aware whether they're being poked by a finger or a random object, and a mechanism to alter the device's centre of mass in flight, to minimise damage on hitting the ground. If cases remain the same size, so too will screens – although future iPhones may reduce the bezel to bump up screen space (or reduce the device's dimensions but maintain the display's size). The question is what resolution the next iPhones will have. The iPhone 6 has 1,334 x 750, while the iPhone 6 Plus renders at 2,208 x 1,242 but downsamples to 1,920 x 1,080. Rumours of the iPhone 6's replacement getting 1080p are probably fantasy, but the smart money's on the iPhone 6 Plus's successor going full 2K, making everything a little sharper. Apple could go further, aping rivals that shove 2,560 x 1,536 displays into similar form factors. But more pixels require compromises, notably in terms of costs, frame rates and battery life. We don't doubt that Apple's screens will become sharper in the future, but battery tech needs to catch up first; there's talk of using OLED display tech, which would help in both respects. In terms of materials, rumours of sapphire displays won't die. However, the material is expensive, has poor drop performance and is heavier than the Gorilla Glass currently used, so don't be surprised if Apple doesn't switch. Especially since Gorilla Glass maker Corning announced this year that its latest glass, 'Project Phire', was as strong as Gorilla Glass and, reportedly, almost as scratch-resistant as sapphire – and with greater durability. Looking further ahead, Samsung, Nokia and others are experimenting with foldable screens, and we assume that Apple must be, too. We can also see a time in the not-too-distant future when haptics provide granular feedback for on-screen controls, along with integrating Touch ID and the Home button into the display. More immediately, Force Touch will come to iPhone, enabling apps to respond to pressure – great for virtual painting, music apps, triggering interface components and playing games. It's likely that 2015's iPhones will get a shiny new A9 processor, with an M9 co-processor onto which jobs carried out by sensors can be offl oaded. Figures being bandied about reckon we'll see a 20 per cent boost in power and a 35 per cent reduction in energy use. Coupled with a rumoured RAM bump to 2GB, this could make for seriously powerful iPhones. Earlier this year, ARM's VP of marketing talked about relevant underlying technology, and unveiled a processor blueprint that took things even further – a 3.5x performance boost and energy reduction of 75 per cent compared to 2014's chips. This kind of increased horsepower could mean that complex computing like voice analysis won't require a Web connection. In other words, Siri in 2016 might be a whole lot more responsive! Storage, however, may remain a thorny issue. When interviewed, Schiller maintained that 16GB iPhones were justified due to Apple's belief that cloud storage can take much of the load. Clearly, the company sees a future where local storage is largely irrelevant, but we don't yet live in an age of ubiquitous high-speed internet and dirt-cheap cloud storage. Until then, iPhone users will remain frustrated at limited storage or feel compelled to splash out on absurdly expensive 64GB and 128GB models. Boring rumours about the next iPhone cameras suggest that they won't change much, or will get a bump to 12MP; Apple's software expertise and in-house camera researchers will combine to keep its devices competitive, with smartphones boasting superior specs on paper. But a curious comment by John Gruber in 2014 stated that Apple was working on a dual-lens iPhone camera system, capable of taking photos comparable to DSLRs. He said this would be the “biggest camera jump ever” for Apple's smartphones. HTC used a dual-lens set-up in its One M8. The main sensor was supported by another that dealt with depth of field. For the iPhone, there are clear advantages to such a system. e camera could be thinner, so it wouldn't stick out from the back of the phone, and blur could be reduced on indoor shots. 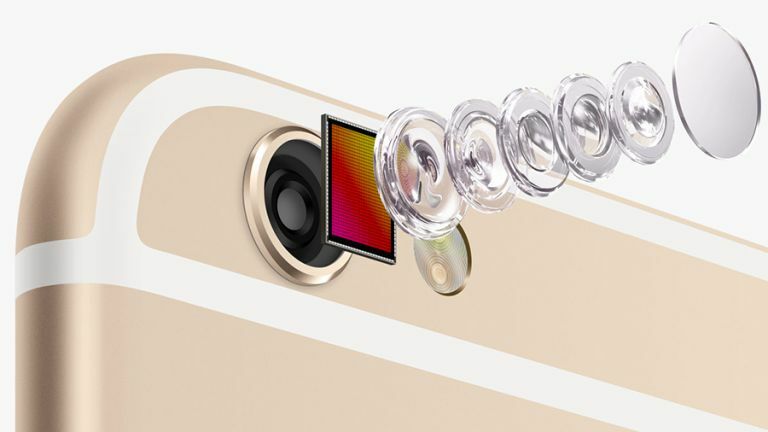 Apple's 2014 purchase of LinX Imaging, a firm that made thin multi-lens cameras, makes sense in this context; and one of its other specialities – capturing 2D or 3D images – suggests another intriguing possibility for future iPhone cameras. A developer discovery points to the front camera also getting some love – functions referred to include 1080p footage at 60fps (double the existing spec), a dedicated flash and the ability to shoot panoramas. So you can look forward to taking beautifully lit, panoramic… selfies. When it comes to wireless connectivity, iPhones will continue to support the latest Wi-Fi standards, gradually boosting local connection speeds (thereby improving streaming and local data sync) and enabling faster downloads. By the time 5G shows up, we'd hope for ubiquitous, reliable connections with lowish power requirements; and 802.11ax will improve connectivity for future iPhones when on public Wi-Fi. When it comes to wires, everything hinges on how bold Apple plans to be. The new MacBook ditched everything in favour of USB-C – one connector to rule them all. Apple stated that if it was going to include a port for charging its new notebook, it should be the most advanced, versatile one available, also ably dealing with video connectivity and data transfer. But will Apple replace Lightning on the iPhone? Its main advantages are the small and reversible connector (largely matched by USB-C), along with its proprietary nature – Apple charges licensing fees for its use. But with rumours claiming that Apple essentially invented USB-C and is invested in its success, perhaps the company will want to push the standard hard, to promote widespread adoption. And with Samsung rumoured to be adding USB-C to the Galaxy Note 5, could Apple go all-in with this year's iPhones, so not to be beaten to the punch? If replacing one lot of accessories and cables fills you with horror, another rumour suggests that the headphone port will also soon disappear (requiring Lightning or USB-C headphones), since it's an obstacle in terms of device thinness. Even the MacBook didn't go that far. At WWDC 2015, Apple revealed iOS 9, showcasing software you'll fi nd on this year's iPhones: the Flipboard-like News; an Evernote-lite Notes makeover; 'Transit' and 'Nearby' views for Maps – although the former only supports a handful of cities. There was also a move towards 'intelligent' computing, with a Google Now-style revamp of search and Siri. The last of those is especially interesting. Apple talks about laying groundwork for the future, taking years to put things in place. The search revamp suggests a gradual shift from the Home screen to contextual, personal navigation and information, your iPhone gradually learning about you and responding accordingly (time-specific apps, relevant contacts and news), rather than you having to hunt. HealthKit could become proactive rather than reactive, and alerts, too, may gain intelligence – an Apple 'advanced haptics' patent details how a device can generate responses appropriate to operating parameters, for example stilling the accelerometer when you're in a meeting. Elsewhere, future iPhones should see vastly improved maps, perhaps with augmented-reality overlays thanks to Apple's Metaio acquisition, a 'street view' (cars have been spotted roaming the US and the UK), and full 3D building walkarounds. Apps should extend further to iCloud, with Continuity becoming fuller, instantly syncing all data across devices, iCloud almost becoming the OS. With enough power, smarts, AirPlay and ubiquitous connectivity, the final leap – years from now – may be the iPhone becoming your only computer; like a futuristic and tiny Mac that you tuck away in your pocket. Assuming that Apple gets the 'smarts' bit right, your handset may even yell should you accidentally leave it behind. Multi-tasking could soon be coming to an iPhone near you. At WWDC 2015, Apple unveiled split-screen multi-tasking for the iPad. It comes in two flavours: Slide Over, which temporarily dims the app you're using and enables you to quickly check something in another before dismissing it; and Split View, where two apps are able to work entirely independently of each other. Right now, these are key differentiators for the iPad, to make the device distinct, but it's not unreasonable to think that multi-tasking of this nature might make its way to the iPhone at some point. After all, the iPhone 6 Plus already has iPad-like features in landscape mode, such as apps that use two-pane views, and an extended keyboard (with copy and paste buttons) that resembles the iPad's as of iOS 9. Although multiple apps on an iPhone 6 Plus might be a touch fiddly, it's not actually the handset's notable screen size that limits multi-tasking features; it's processing power – even the iPad mini 2 gets the Slide Over feature, but Split View is reserved for only the iPad Air 2. The next generation of iPhones should be capable of featuring Slide Over at the very least. So, while it's unlikely that a unique selling point for the iPad will end up on the iPhone by September, don't be surprised if split-screen multi-tasking makes an appearance on whatever fills the iPhone 6 Plus slot in 2016. The 'C' stands for "Can't see it happening"
Want a small iPhone? Don't hold your breath. A big question surrounding the future of the iPhone is whether smaller devices have any future. For some time, Apple pushed back against so-called 'phablets', arguing that a thumb should be able to reach the entirety of a device's screen. The iPhone 6 Plus was Apple throwing in the towel; the mediocre iPhone 5c was Apple setting fire to it. Rumours exist regarding some kind of four-inch iPhone in 2015, but these are scattergun at best. We've heard arguments that the 5s will stick around, until Apple eradicates small iPhones entirely. Elsewhere, there are claims the 5c will get a much-needed upgrade, swapping out its iPhone 5 guts for iPhone 6 innards. Ultimately, any smaller device's existence will come down to the potential for Apple to make a profit. People still make the mistake of thinking a four-inch iPhone is necessary because it could provide Apple with a means of accessing the low end of the smartphone market, but the Cupertino brand really doesn't care about that. Larger devices are where the real money is at the moment, so that's where Apple is positioning itself. iPhone fans who prefer to own a compact device will therefore have to hope for some engineering magic regarding the case, bezel and screen design – or grow banana thumbs.